Protect Against UV & Blue Light! A collection of must-have gift sets to pamper and nourish your skin through the colder months. Trilogy Face Care products harness the powerful skincare benefits of natural botanicals to provide you with the best skincare available. Free from parabens, mineral oils, SLS, artificial colours and fragrances - you can be rest assured that only the best is in each product. 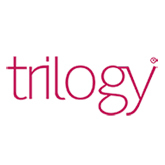 Trilogy are the Rosehip Oil experts, with many of their products, such as Trilogy Cream Cleanser and Trilogy Rosehip Oil itself, containing this certified organic (Biogrow - New Zealand) active ingredient, clinically proven to reduce the appearance of scars, stretch marks and wrinkles, whatsmore it\'s so gentle that it can be used during pregnancy to help keep skin supple and soft. Trilogy Body Care products and treatments are designed to provide you with an overall sense of well-being along with, smoother, softer and healthier skin. Let the natural ingredients in these cleansing treatments transport your skin to a more radiant plain, that reflects the health and vitality from within. As with face care it's important to Cleanse and Tone your body all over, the Cleansing Trilogy Botanical Body Wash and Body Cleansing bar are fuss-free ways to successfully maintain clean and fresh skin - gentle enough to use on the whole family they'll become a bathroom staple alongside your Everything Balm for dry knees, elbows and nappy rash. 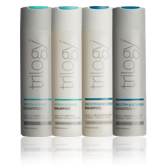 Trilogy Hair Care is designed with the same care and attention as the Face and Body Trilogy ranges. Each product has been carefully formulated to take into consideration the needs of your hair type. Whether you suffer from dandruff and scalp problems or simply want an everyday shampoo that effectively cleanses and conditions - there will be a match for you within this streamlined collection. Why not treat your hair to a weekly Trilogy Botanical Moisture Masque for intensive nourishment that leaves your hair feeling stronger and smoother, alongside your usual routine? View all Trilogy products in one place. 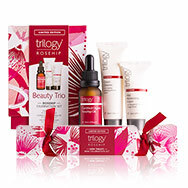 Trilogy cosmetics believe in natural and organic skincare suitable for everyone to enable real skincare benefits. Containing only natural colours and fragrances and free from genetically modified ingredients, Trilogy hair care and body care products are the perfect selection for those who favour natural beauty. Against animal testing, supporting ethical trade practices and with all packaging used by Trilogy being recyclable, you can also rest assured that when you purchase with Trilogy, you buy in the knowledge that you’re not only helping your skin, but the world too. Trilogy face care also focuses on natural beauty, with the organic formulas designed with simplicity, purity and vitality in mind. The five star, best-selling Trilogy Certified Organic Rosehip Oil is a perfect example of this. A certified organic and 100% natural formula, Trilogy Certified Organic Rosehip Oil is formulated from Rosehip Seed Oil which contains Omega 3, 6 and 9 as well as essential fatty acids and antioxidants it contains all that your skin needs. This powerful skincare product which has been clinically tested and shown to help minimise the appearance of wrinkles, smooth the skin and improve the levels of moisture held within the skin, leaves radiant results with healthier and softer skin. The Rosehip Trilogy Oil is also highly effective at addressing skin concerns such as uneven skin tone and acne scarring, showcasing the multitude of skincare benefits of this wonder product. Clinical studies have even shown that the visible appearance of scars can be reduced by up to 41%, stretch marks by 43% and wrinkles by 23%; ideal for those concerned with environmental damage and premature ageing. With Trilogy cosmetics and skincare available on Gorgeous Shop also including a collection of must-have gift sets to pamper and nourish skin, why not introduce a special someone to the wonders of Trilogy too?